Nycote® Laboratories Corporation, the top global manufacturer of anti-corrosion protection technology to the aviation and aerospace industry for the last 60 years, initiates plans to expand distribution lines into India through their partnership with Pexa Aerospace Materials, the leading specialist and supplier of surface coatings to the aerospace and high-tech industries. Nycote is the only global supplier that can deliver an unrivaled multi-block copolymerization process producing a clear, chrome-free, lightweight liquid coating with the flexibility of nylon and the strength of epoxy. The optimized highly cross-linked copolymer coating creates a self-leveling, pinhole free complex barrier that can increase asset lifespan, enhance safety and reduce maintenance costs. Its one-coat technology can be custom tinted, applied on a multitude of surfaces including fiberglass, carbon fiber, fabric, as well as over other coatings. Nycote’s performance is outstanding and is capable of withstanding severe weather conditions while preventing corrosion and conductivity. Trusted and approved by Boeing, Airbus, Embraer and other original equipment manufacturers for decades, Nycote’s advanced coating technology is suitable for both OEM and MRO application and are EU/ IATA/ REACH Compliant. “We clearly saw the potential for robust growth throughout Europe, and with Pexa’s well established relationships with their customers and their commitment to partner with only highly-reputable companies, we were confident that Jim and his team were the right choice,” said Marcie Simpson, Nycote’s President and Chief Operating Officer regarding their exclusive European distribution agreement with Pexa Aerospace Materials. “As Pexa expands into South Asia, coinciding with the country’s commitment to substantially increase commercial aviation, Nycote Laboratories is well-positioned to supply superior and advanced coating products at the level of service and technical support we are known for, and meet the demands of those charged to deliver thousands of new jets within the next 20 years, as well as the country’s growing community of aviation and aerospace manufacture,” Simpson continued. As the Global Anti-Corrosion Coatings Market’s Compound Annual Growth Rate (CAGR) is forecasted to grow 5.2% reaching US$37.2 billion in the next 5 years, which parallels Suresh Pradhu, India’s Union Minister of Commerce and Industry, Civil Aviation’s recent commitment of US$60 billion to build 100 new airports to keep up with the massive economic growth. Since 1956, Nycote® Laboratories Corporation has been the global leader in advanced surface coating technology delivering an unrivaled barrier against corrosion, friction and conductivity for mission-critical aerospace and other applications. Nycote’s lightweight liquid coatings have the flexibility of nylon with the strength of epoxy creating unprecedented protection capable of withstanding severe weather conditions and harsh environments which enhances safety, increases asset lifespan, and reduces maintenance costs. Trusted and approved by Boeing, Airbus, Embraer and other original equipment manufacturers for decades, Nycote’s advanced coating technology is manufactured to order, suitable for both OEM and MRO application, and are EU/ IATA/ REACH Compliant. 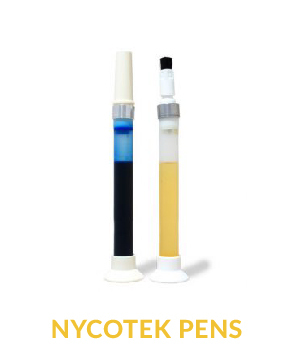 Nycote Laboratories Corporation is an ISO 9001:2015 and AS9100D Certified Company. Pexa is the leading supplier of high technology materials for the aerospace, defense, energy and electronics industries. They are trusted partners with the leading industrial product manufacturers, and employ progressive supply chain systems to deliver on their promises. Their mission is to assist customers to meet their own business objectives using products and services under the Pexa umbrella including superior coating solutions, surface finishing materials, aircraft maintenance products, application equipment and unique packaging solutions. Pexa works in close partnership with material manufacturers to ensure that they offer a comprehensive support package of the products supplied. All products are approved for aerospace application and carry the appropriate certification. Pexa understands environmental, health/safety and regulatory compliance issues, and can help customers achieve and exceed requirements using the products they supply.